Adelaide’s latest beer startup currently contract brews but with about 40 per cent of its first commercial release already sold, the founders feel they are resonating with consumers. Co-owners Kevin Mulcahy and James McCall met in 2016 when they were completing a Certificate III in Food Processing (Microbrewing). Mulcahy, the experienced business person, and McCall, the homebrewer, decided to team up, inspired by what Mulcahy described as an “interesting and vibrant” craft brewing scene in Adelaide. Mulcahy told Brews News that he didn’t feel he had to invest immediately in their own equipment or premises to launch a craft beer brand. “It’s interesting looking at the business plans of a lot of the other breweries as to how they’ve done it,” he said. “Ultimately the brewhouse model is the best one but to get yourself established there are many routes you can take and really for us, the contract brewing one was the best route to get to where we wanted to be in the future. “We really knew that we had some good ideas for beers and I guess that we wanted to get the brand established. “We thought, we can do that through the contract-brewing model first of all, to get the beers out there and to make sure that people like them and engage with the brand, and once that’s all happening we can make the bigger investment in our own equipment. “We just got impatient, we just wanted to get the brand out there,” Mulcahy said. Shapeshifter’s first four beers are currently brewed across the border at the Sow & Piglets Brewery in Port Campbell, Victoria. Currently available in cans and kegs are the Shapeshifter New World Pilsner, Hazy IPA, Pale Ale Single Hop Series Idaho 7 and Session Ale. After two years of pilot brewing, Shapeshifter’s first commercial batches were created in early December 2018. “We gave a slightly longer fermentation period so they would be crisper and cleaner,” Mulcahy explained. “More time meant the beers clarified naturally, which means we didn’t need to add anything to speed up the process. 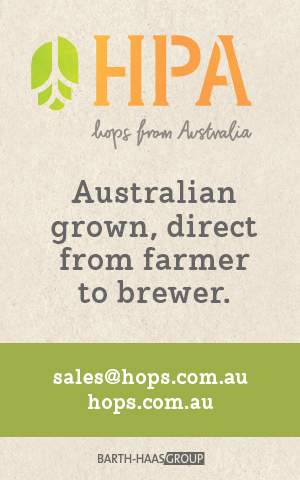 The single hop series has been established at the outset, Mulcahy said, because the market is already flooded with pale ales. “Certainly with a pale ale, you’ve got to do something pretty special,” he said. Mulcahy told Brews News that by May this year, Shapeshifter will have its own caravan to act as the brewery’s first direct-to-consumer platform. “That’s going to be a big part of what we do for this year, that’s to sell our own beer at events through the caravan and then also into bottle shops and venues,” he said. Mulcahy said that the initial business plan will be flexible. While acknowledging they have to walk before they can run, Mulcahy told Brews News he aims to grow volumes enough to be able to distribute east. Shapeshifter Brewing Company is throwing a launch party next week Wednesday, February 6 at Adelaide’s Wheatsheaf Hotel.